Location: Located immediately N of the 'Cornstores', by the car park for the Sports Centre. Built c.1850 for the Llynfi Ironworks, and one of a battery of four, of which three were hot blast and one operated by cold blast. 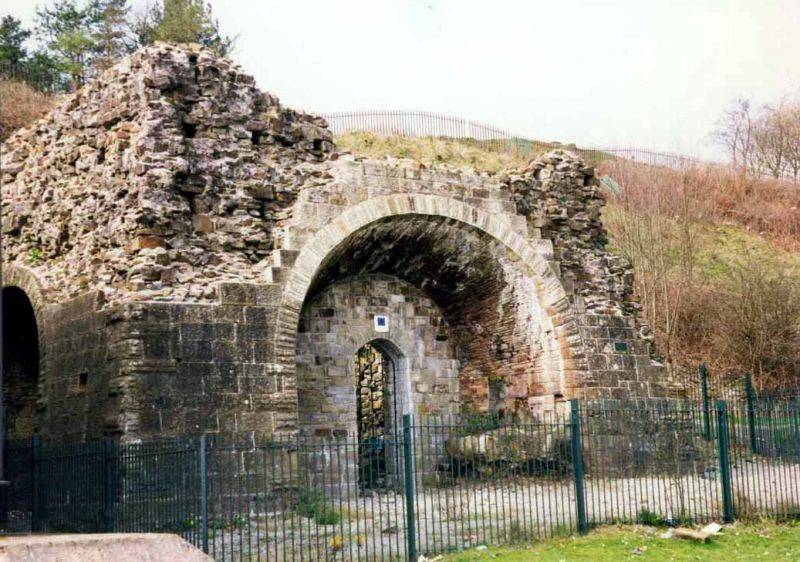 The Llynfi Ironworks (Yr Waith Newydd) was the second ironworks in the valley. The first furnace was blown in 1839. The Llynfi valley blast furnaces were exceptionally tall due to the particular strength of the local coke. The works continued production until the advent of the Bessemer process made local ores uneconomic to exploit, and it was eventually closed in 1886. The structure has since decayed and the upper part of the stack is now missing, whilst some facing stones were taken for the building of St Michael's Church, Maesteg. The structure was consolidated in 1995. Built of rubble stone and faced with Pennant Sandstone ashlar work. Square in plan, enclosing a circular furnace, having three blowing arches to the rear and sides and a casting arch to the front. The stack originally rose as a tapered square cone approximately 14m (46ft) high to the charging ramp which was accessed from the higher land to the S. Each of the arches is of ashlar, and tapers inwards. The casting arch retains the tap hole and and has the cinder notch for slag to one side. The throat was blocked during consolidation in 1995. The upper section of the stack has been destroyed. Included as the only surviving blast furnace in this major iron producing valley, and of group value with the Cornstores building close by. II Church of St Michael and All Angels, Llangynwyd with Maesteg, including enclosing graveyard wall. Located on the N side of Bryn-mawr Place, off Neath Road, parallel to and lying above Commercial Street.